Are you looking for a jungle-themed baby shower gift idea? Or are you organizing a jungle-themed shower and looking for the perfect decorative centerpiece? Well, a jungle theme diaper cake could be just what you’re looking for. Although you might think diapers are an unusual gift, actually the mom of a newborn can never have enough of them, so your gift will be a lifesaver. The creativity you put into making the diaper cake is also something the mom-to-be will really appreciate. 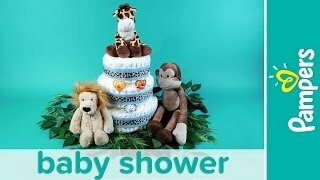 Plus, with these step-by-step instructions, you’ll find it’s easy and fun to make a jungle themed diaper cake. Place some of the Pampers Diapers into the largest (10”) cake pan. Fan the diapers against the edge of the pan to create a spiral shape, and keep adding diapers until the pan is full. Adjust the diaper edges to create an evenly spaced spiral. Place a toilet paper tube in the center of the spiral so it maintains its shape. Then slide a rubber band around the spiral of diapers to hold them all in place. The spiral should be nice and firm. Repeat this process using the 8” pan and the 6” pan. Place the cardboard cake base on a flat surface. Arrange the artificial branches so they cascade over the sides of the cake base. Hot glue leaves onto the cardboard as well. Set aside to dry. Remove the toilet paper tubes before stacking, then stack each diaper layer on top of the other from biggest to smallest. Place the ‘cake’ onto the cake base. To decorate the cake, wrap ribbon around each layer so that you cover the rubber bands. Secure the ribbon ends with hot glue. Remember not to get any glue on the diapers. You can also place a thinner, decorative ribbon on top of the first ribbon to create a contrasting, layered look. Fill the hollow core of the diaper cake with bibs, washcloths, or other baby accessories that fit. Decorate the outside of the cake with jungle-themed stuffed animals and pacifiers. Now that you’re at the end of our jungle diaper cake instructions, how is your diaper cake looking? We’re sure the mom-to-be will love it. If you’re helping to organize the baby shower, get more inspiration by watching this short jungle theme baby shower video, and take a look at our handy checklist, which covers everything you'll need to do to throw a memorable shower.